I have had a couple of e-mails from my readers who were asking if their comments have been received. I have to state this : that no comments have been recorded in my Dashboard! The last one was received on 23 Feb regarding the posting of 30 January "What's in a Word? - The Context of the "Allah Controversy" - The Final Part". 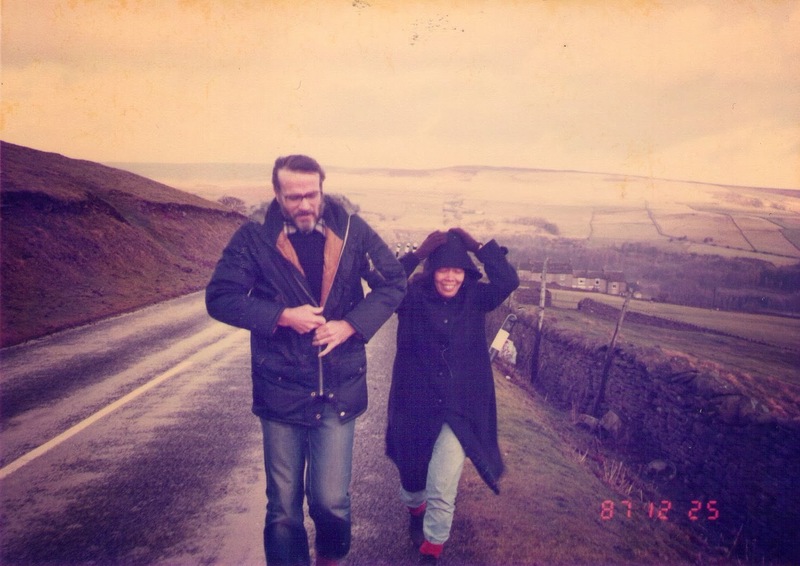 I recorded just one on 20 February for the last posting of "Two of Us - On Our Way Home". As to why, I am as much in the dark as they are. My apologies and thank you for those who tried. Three Score Years and Ten - that's the traditional span of life and Syukur Alhamdulillah I've reached that magic number. Considering that my side of the family has a history of premature deaths through two generations (there was Khamis my mother's brother who died in his mid-30s, and my youngest brother Mustakim who passed away at 33 - both died very suddenly), my elder sister Maznah and my younger brother Mustapha and of course AsH have managed to get through to their late 60s. Observers of the cycles of human life - from foetus to old age - have various ways of allocating the times of our life. The 12 Stage Cycle places me at Mature Adulthood (50-80) where one is supposed to be well established and contributing to the betterment of society. I may sound precocious but I think I did most of that by the time I was 35. According to the BBC KS2 scheme, there are only six cycles of life - foetus, baby, childhood, adolescence, adulthood and old age. Notice that half of those cycles take up only the first 12 years of life. The 8-Stage Cycle places me at the bottom, with the Ageing Adult, those from 60 onwards. They have their exits and entrances. I suppose Shakespeare could not see into the 20th and 21st centuries, where the last scene of all starts from a much younger age, where humankind have become childish, peevish and oblivious of their selfishness and arrogance - even though they still have their teeth, good eyesight and voracious appetite for everything! And that brings me to a very revealing sighting of our humankind, particularly our Malay-Muslims. We were in transit at Abu Dhabi bound for Kuala Lumpur. There were many pilgrims returning home to Malaysia after their Umrah. As usual, we all had to be strictly checked for security before getting to our boarding gates. I had almost finished plonking my hand luggage, handbag, coat, laptop into the trays when this Malay lady dressed in a white telekung pushed herself in front of me to grab the tray that was meant for my laptop. I was taken aback and even more so when the Security Officer, an Arab, ticked her off and told her to "Sabar!". Well that stopped her in her tracks but this was hardly good for the reputation of Malay-Muslims ( and a woman at that!) in the eyes of the Arabs, a people that our Malays are working so hard to imitate and emulate! Alas, it did not end there. As the spouse was walking towards the electronic security door, another pilgrim in her telekung stepped in front of him, and snapped "Excuse me!" with an inflection and intonation that said "Move over " and not "Would you mind if I ...?" This was no kampung macik/kakak from some small town like Parit Botak in Johor. This was one helluva street-savvy, educated Malay who knows how to get what she wants (especially now that she's done her Umrah). And both of these Malay-Muslim women were younger than us! But we live and learn even though we're now way past our live-by date. ...... our papaya tree laden with Allah's bounty. Talking about age is mostly a game of number crunching - more relevant is what we do with our lives while we're still alive and kicking. After I lost my beloved brother Akim in 1982, each morning when I wake up to the sky, be it grey in Leicester or sunny in Malaysia, I thank the Supreme Being for giving me this pleasure. Each new day is a bonus ... and that's how I perceive life - and old age. Two of Us - On Our Way Home. Our good friend Jack has been over on most recent Saturday evenings to watch a very interesting TV programme on "Wild China". We would share a small supper and after the programme, Jack and spouse would depart to the latter's study where the two of them would go surfing YouTube for Opera songs, not the fluffy modern singers like Katherine Jenkins and Il Divo but the ones from the 30s, 40s and 50s like Amelita Galli-Curci and a younger Maria Callas. In the process they discovered a fabulous young tenor from the US called Lawrence Brownlee - Jack, an expert on classical singing, reckons he's the best singer around at the moment.....better than Luciano Pavarotti. At about 11 pm we would walk Jack back to his house which is just 5-10 minutes away. Before the three of us became old and decrepit it would have taken us just short of 5 minutes !! Last Saturday, on our way home from Jack's, we bumped into our former neighbour and friend Doug. He was walking home alone from Barry's house (about 20 minutes distance from his own house). The time was nearly a quarter to midnight! He was just as shocked as we were to meet up so late. We told him of our trip back to KL and there was a hint of disappointment in his voice when he expressed his regret that we had shared only one get-together since we got back to Leicester. You see, we had arranged for Doug to pop over for dinner five weeks ago. But we, especially AsH, had a nasty infection for three weeks and everything had to be put on the back burner including our planned return at the end of January. We got back home, we pondered and we agreed that despite our imminent journey we must have Doug over for a meal. And we did just that two days ago. And Doug was so pleased to share the meal and the time. And we walked him home as well ! Douglas Holly and we went back a long way, since the mid 1980s. He was then a lecturer at the University of Leicester School of Education. I had applied to do my Masters at the School of Ed in 1983 when I was about to end my teaching contract in Brunei. I waited and waited in vain for a reply from them. Finally I had to call upon my former Geography Tutor who was teaching in Leicester University to make an inquiry. He got in touch with his 'mature student' Frank Moule who knew a lecturer from the School of Education. That lecturer was Doug Holly. Now one could describe Doug as an old-fashioned liberal - his political stand would be very much to the left of centre. He went to see the lecturer-in-charge of Admissions to find out what had happened to my application. It seemed that this lecturer Dr RK had chucked my application to the bottom of the pile, simply because it had come from Brunei! Doug then called upon Morag Carsch who was in charge of one of the courses I was applying for. They both looked through my 'suitability' and they both advised Dr RK that I should be given a 'yes' reply soon - before I 'relocated' to another University. I did Doug and Morag proud because I became one out of two students to gain a Distinction in the M.Ed course. And I did enjoy bumping into Dr. RK whenever I could - just to gloat. After the spouse and I got married we visited Doug at his little terrace house at Oxford Avenue. We liked the cosiness of the Avenue (and Doug!). So sometime during late 1986 we bought No 10 Oxford Avenue and we moved in. I could not think of a better and happier place to live in - our neighbours and the neighbourhood were just perfect. Today, sadly, as with most things, it has all changed - for the worse. We were neighbours for 19 years. We got on because on many political and social issues we had a lot in common. However at the height of the protest over Salman Rushdie's "Satanic Verses" in 1989, we discovered a chink in our relationship. 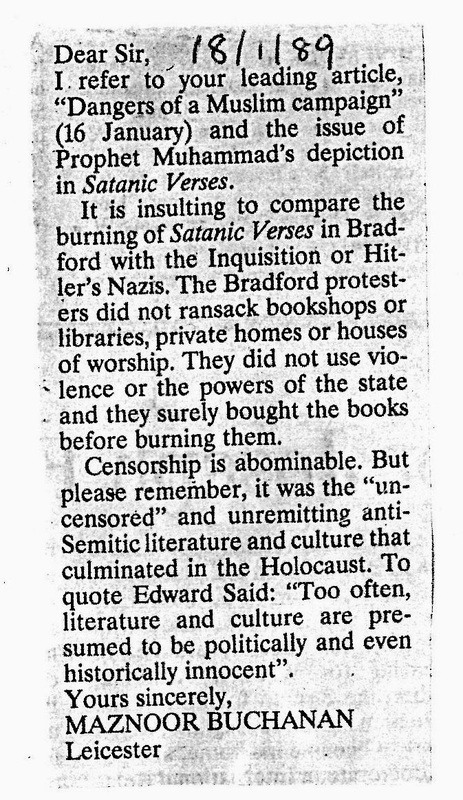 We could hear on that summer's day in 1989 loud protests against "Satanic Verses" and Salman Rushdie coming over from nearby Victoria Park. In summer, most of us kept our front doors open. From Doug's door we heard him shouting angrily against the protests from the Park. His one sentence "After all we've done for them!" shocked us. "Them" referred to the Muslims! And this came from someone who saw himself as a broad-minded liberal and a vocal supporter of multi-culturalism. This made me realise that the white man's liberalism, anti-racism and broadmindedness are really skin-deep. When it comes to Islam and Muslims, that entrenched hostility and insecurity which fills their religion, literature, history and culture floats up to the surface - even for someone like Doug who sees himself as an atheist. We decided we had to square this circle with Doug. We went over to his house and had a civilized discussion about freedom of expression, about the pathological phobia of the West against Islam and Muslims and what we thought of Salman Rushdie the Wog, the darling of British culture and of the literati. It did not break our friendship - we were sensible, thinking adults and were willing to listen to each other. That incident - and what I saw and heard in later years - pushed me to read and learn even more, especially about Christianity and Western history and culture. Just after we got married, my father-in-law Professor K.M. Buchanan posted me a little pamphlet ( from Wales where he was staying) about what the West owed to the Arabs - in the field of mathematics, philosophy, architecture, medicine etc. etc. It was an eye-opener for me. It only told me how ignorant I had been about the world , about my Muslim world. I began my own journey into this world and the western Christian world starting with books by Edward Said , Noam Chomsky - and V.G. Kiernan's "European Empires from Conquest to Collapse (1815-1960)." For these discoveries I have to thank my father-in-law Keith and his son. After that little fracas with Doug I articulated my frustration in a long essay about the context of the "Satanic Verses" issue which I still store in my files. I wrote a letter of protest to The Independent which was of course heavily edited. From then until today, my inquiry and my learning have not ended The maverick and rebel in me became even more consolidated and tenacious. As for Doug and us, our friendship grew stronger with the years. We have a lot of respect for him. He remains committed to CND, Friends of the Earth and the local Community Committee. He has lived alone for as long as we've known him. He has his family who keep in touch with him especially for Birthdays and Christmas but he leaves them very much to themselves and makes sure that he doesn't become a burden to them. He is a keen solo traveller, has been round the world sans the frills and luxury, goes to the gym and takes a long walk in the English countryside ( usually ending at the local Pub) every week - and he loves my cooking! And Doug is 84 years old. This has turned out to be a long posting when all I wanted to write was about our trip back to KL - arriving InsyaAllah on Friday 21 February - just a day short of my 70th birthday. "You and I have memories - longer than the road that stretches out ahead." Anak si Hamid and Son of Buchanan have travelled a long way - physically and metaphorically - together, and with people like Doug Holly and Jack Marlowe as inspiration we hope to do a lot more, InsyaAllah. The last posting I did on Sekolah Menengah Yusof Ishak or Yusof Ishak Secondary School was on 5 November 2013. Here's the next part - belated - but better late than never. It began with how I was trained - to be an accredited teacher - notwithstanding the advice given to me by the Che'Gu in the Ministry of Education! There was no Institute of Education then. It was just the Teachers' Training College - where they produced Primary School teachers ( with O Levels), Lower Secondary School teachers ( with A Levels) for all the language streams. Graduates were given a one-year, part-time, in-service training - with one difference. There was no provision for Malay Stream Graduate teachers. One can understand why by checking - for instance - the number of Singapore Malays who were bonded by the Special Malay Teaching Bursary in this Convocation Programme of 1967. There were only three of us. So I embarked on my professional training as a teacher from May 1967 to April 1968. This Certificate ensured that I could be let loose in YISS or any school in the Republic of Singapore. But for me, there was one problem. For Group V (Classroom Teaching) nobody came to supervise me in the classroom until just before the Professional Examination. Why? As there was no provision for training graduates to teach in the Malay medium, I did my training in the English medium. Of course no lecturer could supervise my classroom teaching because I was teaching in Malay! So I was left on my own, dutifully writing and preparing my Lesson Notes waiting for a Supervisor. I attended my lectures in the afternoon (after teaching in the morning), wrote my essays, did my Examination - albeit with a bit of ponteng now and then to Orchard Road and the Lido Cinema. Then someone must have noticed that Maznoor binte Abdul Hamid had not been supervised for her teaching practice - at all!! So towards the end of the school term, the Director of Teacher Training (Malay Section) at the TTC came to 'supervise' me. Well, there was nowt to supervise because the school examination was just over and we were just minding the kids with quizzes and games. Nevertheless, I had to make a 'show' of teaching my students who were puzzled at what was going on. He checked my Lesson Notes of the last few months and then he left. That was how I cleared the Group V - Classroom Teaching for my Certificate-in Education. No wonder the Che'Gu at the Ministry showed me the "Rokok". As for the part of teaching in Malay, I shall try to summarise my agony and grief in teaching Ilmu Hisab, Ilmu Alam, Tawarikh and Karangan during my first year of teaching. I was given Menengah Satu to teach - children from the Southern Islands. Normally Menengah Satu classes would be in the afternoon but they were given a concession because of where they lived. Here they are - my unforgettable first class. I reckoned they had a lot more to teach me than I could teach them. I think I now have to clarify my situation about teaching in Malay. Firstly, I'm an anak Melayu through and through. I have not deigned or 'forgotten' how to speak my mother-tongue. But that does not mean I am automatically qualified to teach various academic school subjects in a Malay secondary school. As teachers, we know that it is more difficult to teach young children. You need the right technique and to choose the right words to put across simple terminologies like suhu, tekanan udara, sistem pentadbiran, tamaddun, angka pecahan (fraction), segitiga, segitiga tepat, segitiga duasama etc. etc - especially for my Menengah Satu charges. How did I survive ( if I did ) my first year? Well, every weekend my Abah and I would spend hours translating and preparing my Geography, History and Mathematics lesson for the week. We would have at our disposal the English-Malay Dictionaries prepared by DBP. We had to look for the right terms to use as well as construct the right sentences to frame the lesson. I guess I really earned and deserved that $700 salary!. But one little faux pas I have to mention. Our Senior Teacher for the Malay medium was Che'Gu Shukur - a gentle hardworking teacher of the old school. He was passing my class one morning. He then called me over to the door. He corrected me - ever so gently and kindly and quietly that the word 'river' was spelled as sungai and not sungei. I did feel stupid and I thanked Che'Gu Shukur for putting me right. You see, my English language textbooks spelled it with and 'e' and not an 'a'. The colonials spelled it the way they pronounced it. I wonder if that Che'Gu in the Ministry knew about that problem before he suggested the word "Rokok" to me. Compared to our refined Che'Gu Shukur, this bureaucrat was too clever by half! Just for laughs: This was how my use of Malay - as my mother tongue, my medium of teaching and a requirement for confirmation in the Civil Service - became slightly entangled. Even though I was considered 'good' enough to teach in Malay in a secondary school I still had to be certificated with this piece of paper. What level does this certificate identify with? Standard One ' approximates that of Primary Six in Government Malay Primary School'. All in all, my qualification for teaching academic subjects in Malay in a Malay Secondary School ranged from P7 ( for my 'O' Levels) and a pass at the level of Primary Six in a Malay Government School !! I now think I will really need that "Rokok" from the Ministry's CheGu ! There are so many stories and experiences I could recall in my seven years at Sekolah Menengah Yusof Ishak. But we old people have to be careful not to natter on too much about the past. But bear with me these few samples. I have a higher estimation of Che'Gu Shukur - an older generation of Malay teachers- than I have of those of my peer group and those a little younger than him. Because I was a woman and (I will not hesitate to state this) because of my qualification, many of the male (and female) Che'Gurus did not regard me as their 'cup of tea'. I was almost an anathema to them. It's ironic that the non-Malay English medium teachers in YISS did not harbour such a hang-up over their younger male and female graduate teachers. In those days, schools were not provided with Overhead Projectors. Maps had to be drawn on the blackboards - especially special maps that were not available in the Malay textbooks. In the Geography Room, I drew a map of the Industrial Region of the Ruhr Valley (for my Menengah Empat students), which took up less than a quarter of the board. I left a courteous note asking that the map remained on the board as I had four classes of Geography to teach. The very next day, I discovered it had been erased by someone, a colleague from the afternoon session! Examination questions which had been discussed and chosen by a panel of teachers were leaked to students - so that the teachers concerned would look good when their classes gained top marks and many passes. I embarrassed my poor Abah when I asked him the meaning of a word that my colleagues were bandying about during recess time in the Canteen. Each time they said this word, they looked at me! This word was part of another teacher's name. Abah bit his lower lip and said , "That word refers to a man's private part." From then on, I would sit away from these Malay male colleagues in the School Canteen whenever I could. One Saturday, during an ECA period, I went across to this Malay girl who was crying by the staircase. She told me her father was ill in Malacca and she had no money to pay for her fare. So I gave her $30 to help her out. (I was then earning about $23 a day.) In another instance, I offered a monthly allowance of $20 for two years, to my student, Ang S.C. ( from Pulau Semakau ) when he started his 'A'Levels at National Junior College. I had taught him for 4 years in YISS and he came from a needy family. I thought my little contribution could at least subsidise his bus fare from Old Jurong Road where he lived to the NJC at Bukit Timah. I found out later from my students that the crying 15 year-old had actually used the $30 to run away with her boyfriend! Ang S.C. did write once or twice to thank me for the monthly Money Order. I heard later that he had joined a Christian Group in NJC. All these sound very much like "Meludah ke Langit". But there were also wonderful people like Che'Gu Ayesha Bevee and Sim Loo Lee. 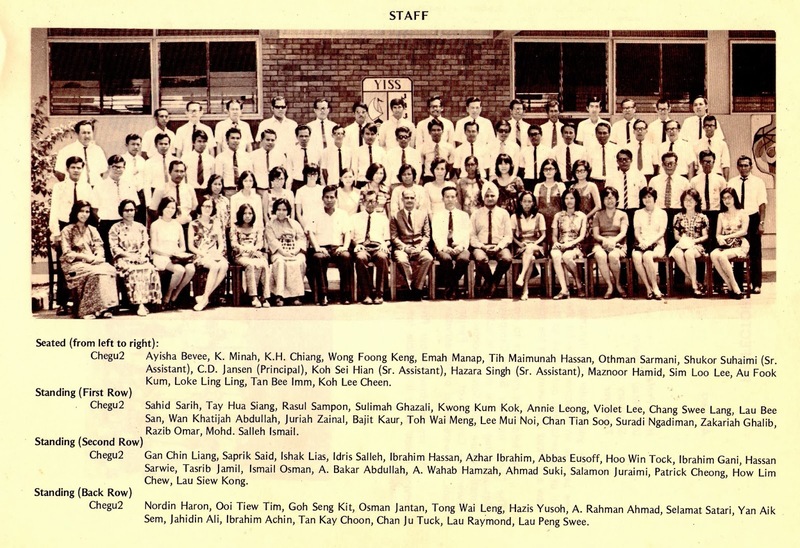 Ayesha is seated to the extreme left, front row, Loo Lee is fifth from the right and Che'Gu Syukur is seated eighth from left. In 1972, after 5 years, I cleared my bond with the Singapore Government's Public Service Commission. With my dear good friend Loo Lee we headed west for London to further our studies. But that took some doing for me - that's another story which will only bring up too much bile.